Regularly updated POI csv file for the combined rest areas in the lower 48 states. This file includes rest areas with restrooms as well as rest areas without restrooms, some truck rest areas with restrooms, rest areas with scenic views, historical rest areas, turnouts, rest areas that are under construction, etc. Column C can be sorted by State, Highway and Direction of travel. Column D can be sorted by which facility is wanted. RR, PT, VM, Pets, HF, Misc (includes RV Dump,Phones,Scenic views,etc) I believe most users would sort on RR, however,this will not be necessary since there is now a file listing only those locations that have restroooms. This tutorial outlines some of the nomenclatures used in the combined list of rest areas in the lower 48 states. The coordinates shown, in the great majority, are the coordinates for the entrance to the "location" off ramp. #1 "Locations" are Rest Areas, Welcome Centers, Service Plazas or Turnouts. Every attempt was made to get the off ramp entrances for both directions of travel on a highway. #4 If the location is located in the center or median strip of the highway this will be shown as "FL,FL TP,NB,SNAPPER CREEK SERVICE PLAZA LEFT EXIT, MM19" to allow time to get in proper lane. destination. These are noted with the word "ADDRESS" in column C.
One recommendation: When you set the proximity alert for this file - do yourself a favor - set the alert for 1-2 miles to give yourself ample time to get into the correct lane with ease & safety. Credit for the original file goes to Retired Technician (RT) and also for his POI Verifier software which caught (and still catches) input errors. Thanks RT! A special thanks also goes to MrKenFL for all the time and effort he put in to maintaining this file for 8 years. Thanks MrKenFL! Noted: The rest area GA,I-75,SB,Monroe County Rest Ares ,MM 179 is Open. Updated the status of Interstate rest areas. Updated the open/closed status of some rest areas. Added the Rangely (BLM) rest area in CO. Noted that the I-80 Rest Areas (Salt Flats and Grassy Mountain) located in Utah have flush toilets. Updated the GA interstate rest areas to the latest GDOT listing. According to GDOT the rest area on I-475 NB, in GA has reopened today. With the exception of I-475 NB rest area and I-75SB,MM179 rest area, all GA interstate rest areas are Open. Cook County Rest areas (NB and SB) on I-75 in GA have reopened.. Corrected the coordinates for the US19/74 Andrews rest area in NC. Also added 3 new locations in Tx without RR. Submitted comments regarding the Haywood County Rest Areas in NC. Noted that the WB Sacaton rest area, I-10 MM182 in Arizona is closed at this time. Updated the rest areas in ND. 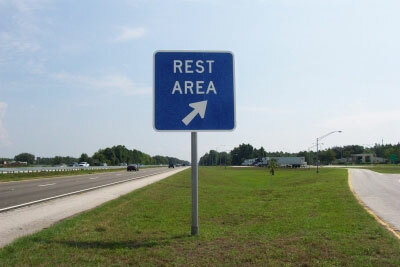 Noted a new rest area on I-77 in NC. This replaces 4 other rest areas along this stretch of I-77. Indian Nation TP-Oklahoma. Added the McAlester Service Plaza and removed the Antlers and Eufala Service Plazas. Added 4 rest/picnic areas in TX, No restrooms. Submitted coord for the new off ramp leading to the Fl turnpike Snapper Creek Service Plaza, traveling northbound. Noted that the Beaver Dam Service Plaza in KY has reopened. White River Rest Area in Arkansas has reopened. Updated the status of rest areas along I-75/475 in GA. Updated the rest area information in northeast Wyoming and added 5 new locations. The GA rest areas in Laurens (I-16) and Glynn (I-95) counties have reopened. Noted that the CA,I-10,WB CACTUS CITY REST AREA AND BOTH THE EB AND WB WHITEWATER REST AREAS ARE OPEN. Updated the status of the IN I-80/90 travel plazas. Added rest areas along TX-385. Picnic/rest areas, no restrooms. Added 6 picnic/rest areas in TX. These do not have restrooms. Submitted 2 closed rest areas. TX,I-40,EB And WB,Picnic/Parking,MM173. Neither of these have restrooms. The EB and WB Pajarito Rest areas on NM I-40 at MM 302 are both closed. Updated the open/closed status for a number of rest areas. Noted that the Beaver Dam Service Plaza in KY is closed for renovation. Submitted 3 new rest areas with restrooms and 1 without in Me. Corrected the wifi status for the rest areas in Tx. Submitted changes to the file. See the Rest Area USA discussion thread. Noted that the Pride of the Prairei rest areas in Illinois have reopened. Also submitted 2 parking/picnic rest areas in texas. Submitted 2 deletions for rest areas on I-40 in OK. Submitted changes for rest areas in MT,WA and WY. Updated the status of a number of locations and also added 8 new locations. Rest area on SC,I-77,SB,MM66 has reopened. Also updated rest area data for Missouri. KY,I-65,SB,HART COUNTY REST AREA, MM60 has reopened. Noted that the OH,I-71,SB,Warren Rest Area has reopened. Noted:The rest areas on MO,I-70, EB, mm 167 & WB,mm 169 are truck parking with NO facilities. Updated the status of the CA interstate rest areas. Updated the status of the Georgia interstate rest areas. Noted a problem with the coordinates for the KY, I-64 EB Rest area at MM 29. Aided in establishing the correct coord for an alert for the I-10 TX EB welcome center MM1 rest area. Added 6 County Picnic/Rest areas in Texas along US 84. None of these have restrooms. See the note titled RV Travelers in the Rest Areas-USA discussion thread for the rest areas added. Submitted the correct coord for the Elkhart Rest areas on I-35 in Iowa. Noted that the Van Wert rest areas on US-30 in Ohio were missing from the file. Submitted coordinates for the I-75 Tn NB welcome center to prevent an alert when traveling SB. Updated the Closed/Open status of the rest areas in California. Upgraded the status for the California I-10 rest areas. Added Grand Bay Welcome center in AL and the Sumter county welcome center in AL is now open. TXRVer submitted 6 picnic/parkings areas, 3 in TX and 3 in NM. None of these have restrooms. Submitted 4 Picnic/Parking areas in TX and 1 in NM. None of these have restrooms. Added service plaza tourist information center on Rt-3 MA. 4 of the 8 travel plazas in Indiana are closed for reconstruction. Added Welcome Center on I-495 Long Island Expressway and also 4 basicallly truck rest areas. Submitted 3 closed rest areas. 1 in OK and 2 in AR. Updated the MM numbers for the rest areas in CT using Google Earth. Noted that the rest area in CT on I-95 at MM65.5 is closed. No est for reopening. Submitted a reopened rest area on RI I-95 NB at MM6.2. Also corrected MM locations on NB and SB rest areas. Submitted a picnic/parking area,no restrooms on US-24 in Illinois. Added additional areas with restrooms. Noted that the rest area on OK, I-35, NB at MM224 is closed. Noted that the Hart County Rest Area located in KY on I-65 SB, MM60 is closed due to a fire. Rest area on I-77 SB in SC is closed. Noted that the RV Dump at the MD I-95 SB welcome center has been removed during renovation. Updated the status of the rest areas in CA and IL. Noted that the Willow Creek Rest Areas on I-39 in Illinois are now open. Corrected the coordinates for the GUILDERLAND SERVICE PLAZA on the NY Thruway. Also added additional MM numbers to the file.. Submitted corrections for the Grantville and Naungalo rest areas in PA. Submitted some changes to the MM column in the file. Submitted corrections to make sorting on MM easier. Moved 7 locations from No restrooms to these locations have restrooms. Also added 3 new locations. Noted: The names on US-287 rest areas Wise and Hardeman should be reversed. Noted the hours that the Missouri welcome center is open for business. Shows in column D.
Updated the open/closed status of the interstate rest areas in CA. Completed the file update thru SD. Net increase of 19 locations. Completed the update thru OH. Submitted 2 closed locations in AZ. Completed the updating thru NY. Increase of 166 locations. Submitted an updated listing of the rest areas in Missouri. Updated the file thru Maine. Submitted changes to prevent alerts occuring in the opposite direction thru CA. Submited some changes in OK and TX. Update completed thru Florida. Net increase of 35 locaitions. Completed updating AL,AR,AZ and CA. Net increase of 24 locations. Adjusted the coord for AL, AR and AZ to prevent alerts when traveling in the opposite direction. Submitted coord adustment for the TN EB I-24 MM133 and the GA SB I-75 MM319. Corrected errors that occured during the updating. Updated to Ver. BJ on 3/15/2014 with 21 changes in 11 states ! 2/12/2014 Updated to Ver. BI 11 changes in 4 States, Net increase of 1 location. 10/13/13 Updated to Ver. BG - Increase of 8 locations in 11 states ! 7/7/13 Updated to Ver. BE with 39 changes including 18 additions ! 6 Changes in 4 states (CA, OK, TX, WV) - decrease of 1 location ! Updated to Ver. AS on 3/22/2012. Many insignificant changes to rest area in NM !